RCA portable test jig. 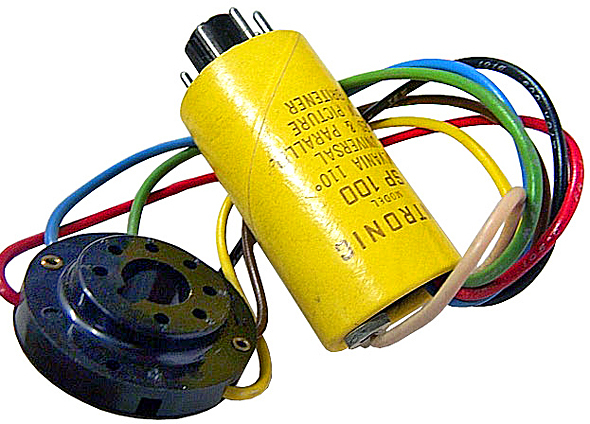 Model #10J105 (transistor-type). High impact plastic with rubber feet. Circa 1967. 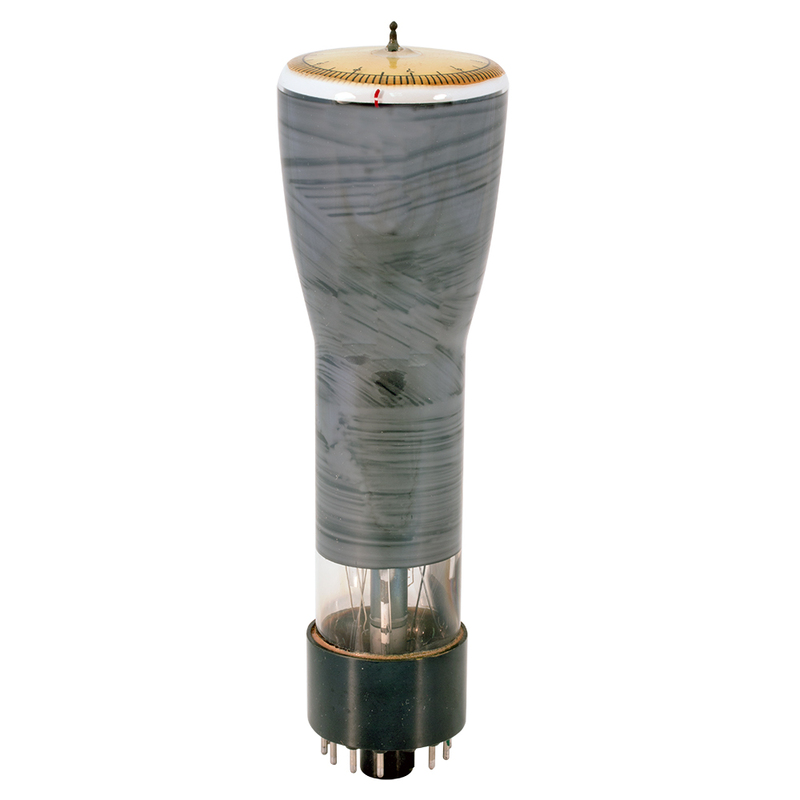 Uses 18" color picture tube (not included). 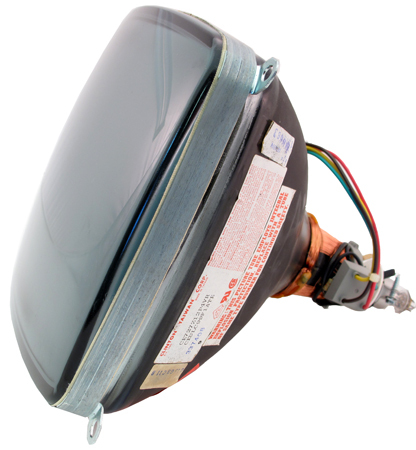 CRTs available on this page. See pictures for included parts. Only 3 available (in the World). 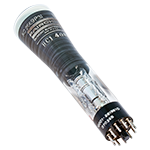 Dumont (for Fairchild) 11 pin CRT tube. 1.75" diameter, flat face, 8" long. New in box. #s on base: 10001-2619810, 070368. Only one available. 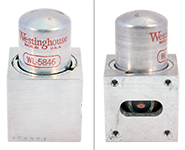 Westinghouse fixed frequency, transmission type, vacuum sealed, reference cavity. 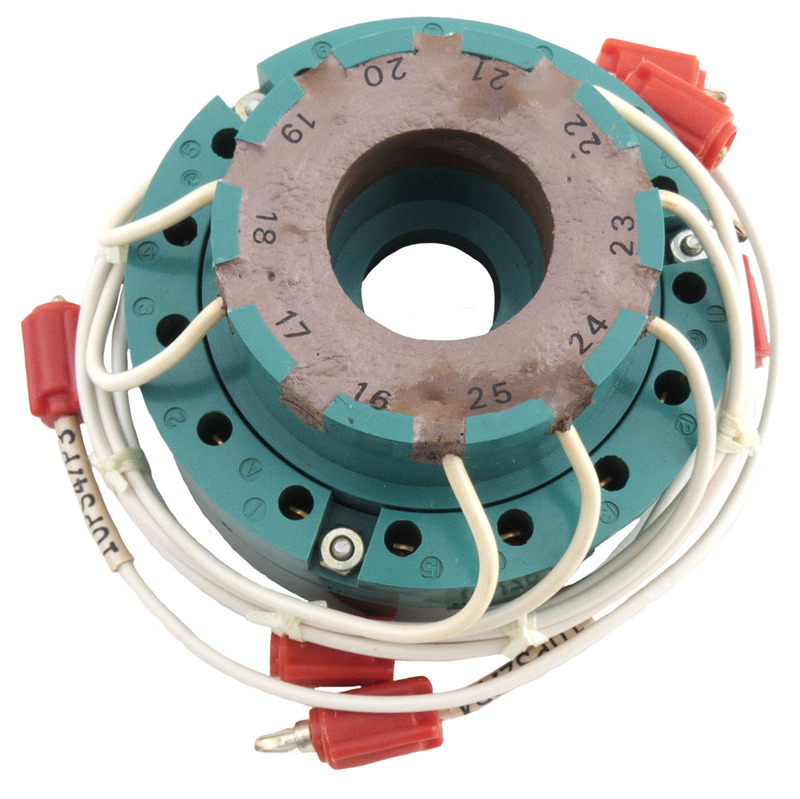 For use at 9280 mega-cycles as a frequency determining reference. New, vintage surplus. Sealed in cans. Circa 1949. 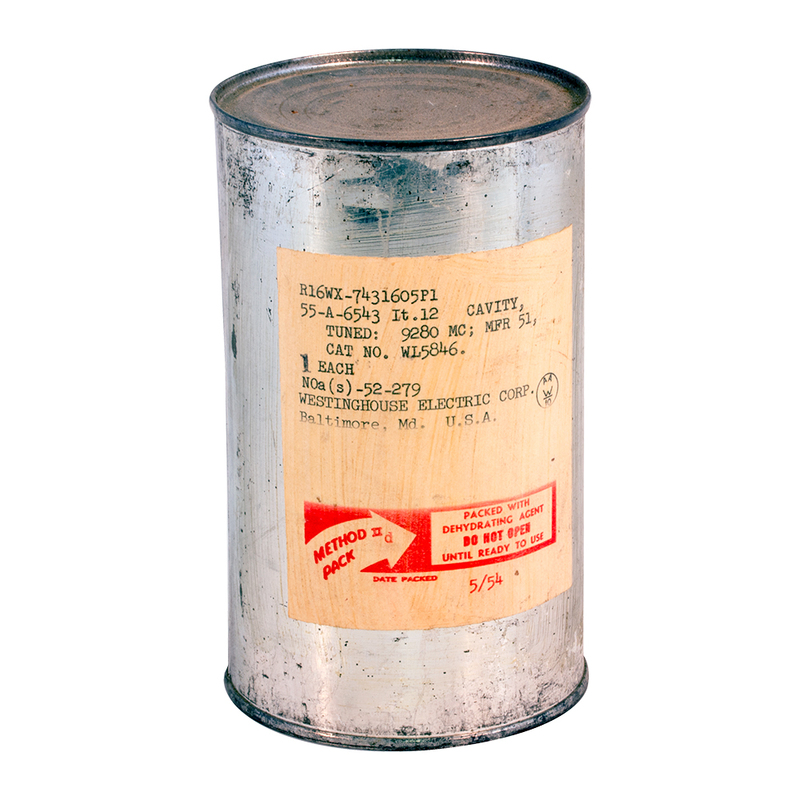 Equivalent Tube #CV2859. 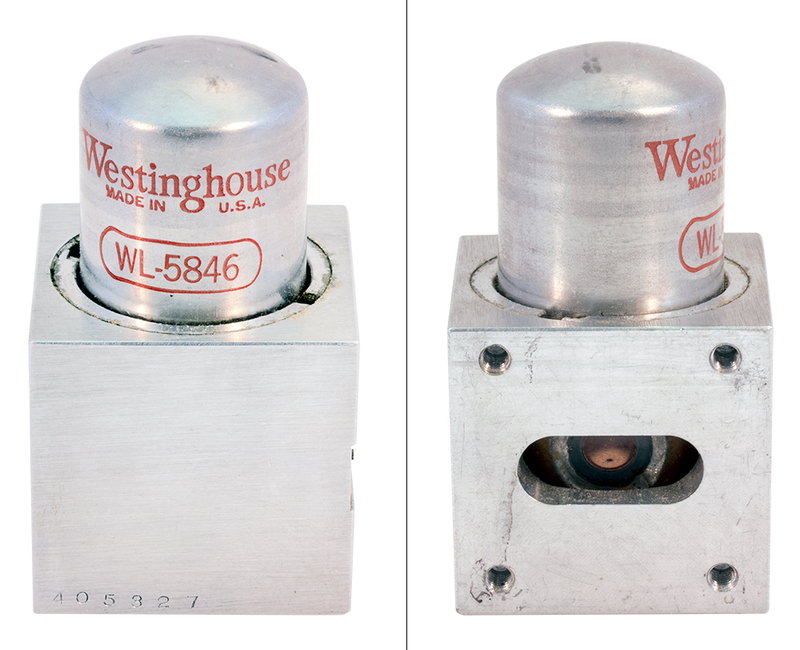 Westinghouse CRT socket. 2 contact rings. Inner - 10, Outer - 15. 1.61" to center inner pin radius. 2.78" to center outer pin radius. NSN: 5935-00-824-9650. 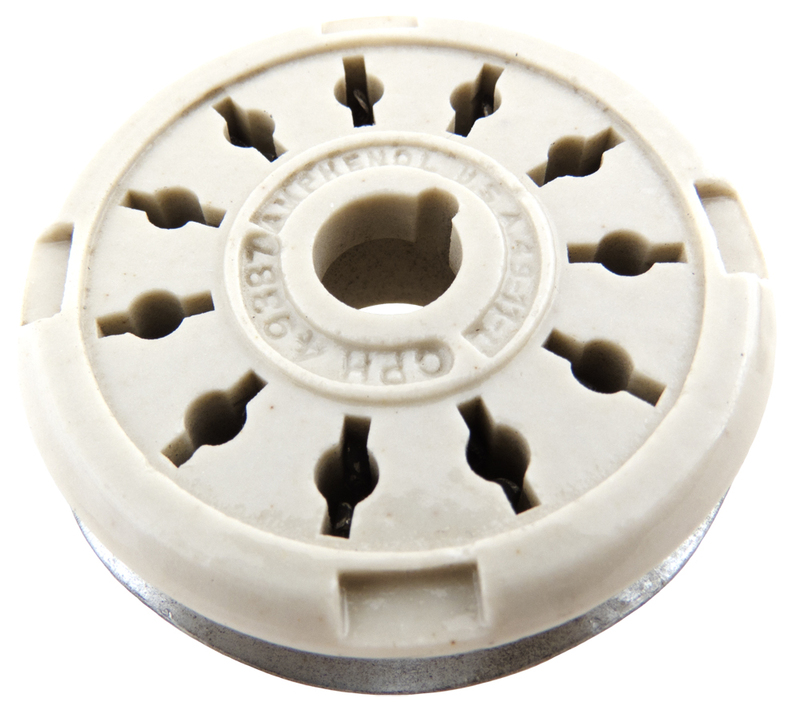 Amphenol steatite 11 pin socket with retainer ring. Silver pins. Center key. 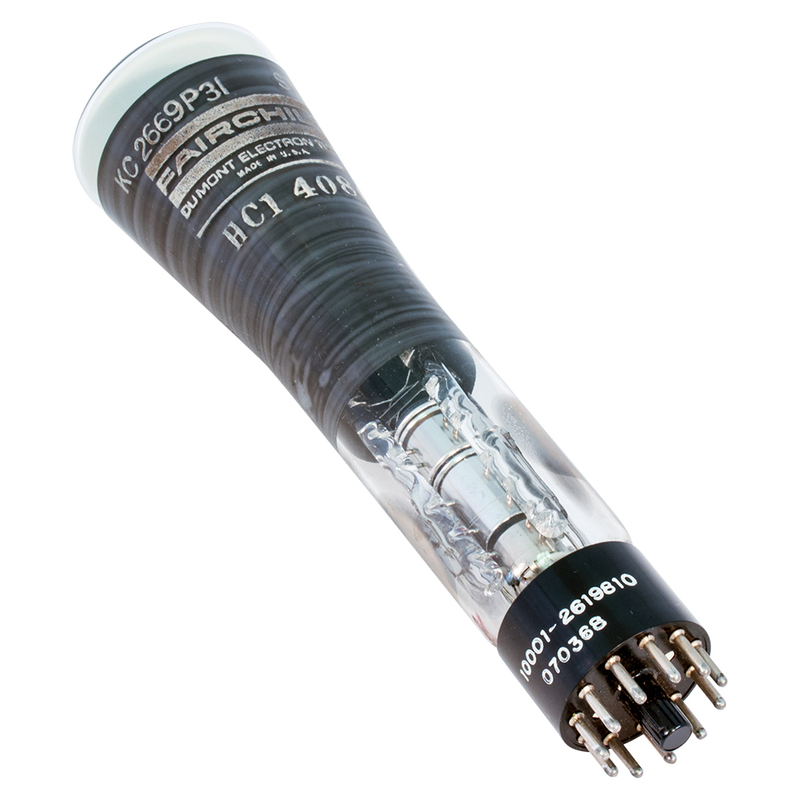 Fits CRT tubes like 5BP1. Requires 1-5/8" chassis opening. 0.719" extends below chassis. 1-3/4"d x 0.874"h overall. 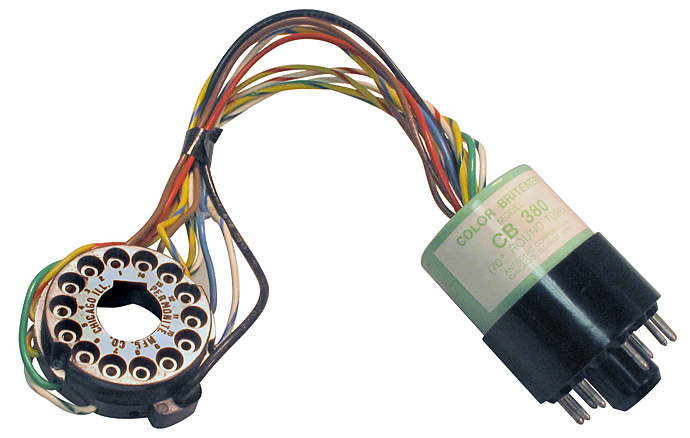 CRT tube used in Apple Lisa, some medical equipment, and in some Allen Bradley CNC machines. Mfg P/N: CEULC99F1ATE, CE727Z12P4VR. Antronic heavy duty 70º color TV britener for round tubes. Model CB-380. Restores brightness and contrast. Increases life of color tube. Instructions on the box. Made by General Atronics / Magnavox. 12" diameter CRT , 25" long, 14 pin base is 2-1/4" diameter. 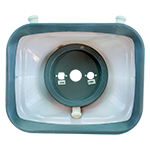 The P19 is a orange phosphor of moderate duration used mainly for military radars. Brand new. Mfg P/N: 12ACP19, RELEASE2139, K1137P19. CRT socket. 14 pin. 10 cloth leads pre-wired. 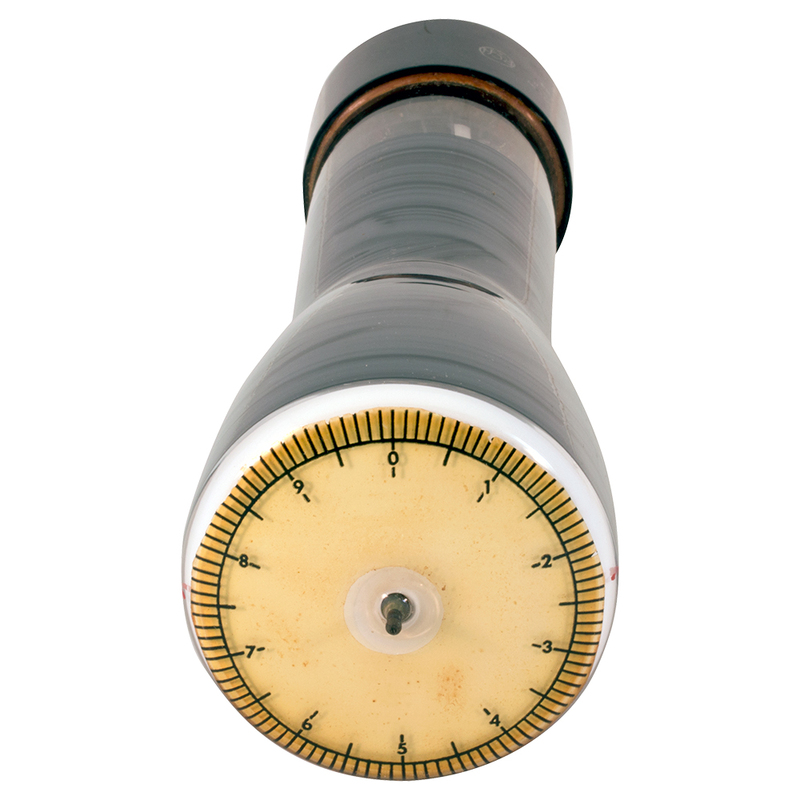 Brown bakelite. Fits 3BP1 CRT among others using medium shell di-heptal 12 pin base. 3/8" c-c adjacent pins. 1-11/16" c-c straight across. 2-1/2" diameter x 1-1/2" high. NOTE: Sold only with purchase of (TUC) 12ACP19. 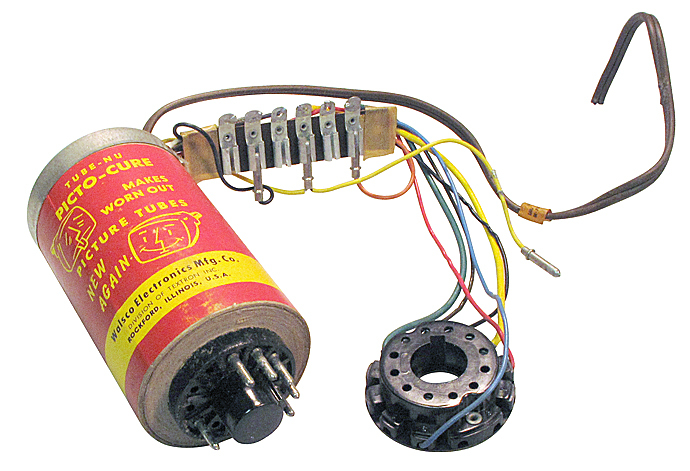 High voltage CRT anode connector. 18" lead wire. 5" phenolic CRT cover. 5-9/16" opening. 7-1/8" x 7-1/8" x 0.06" thick. 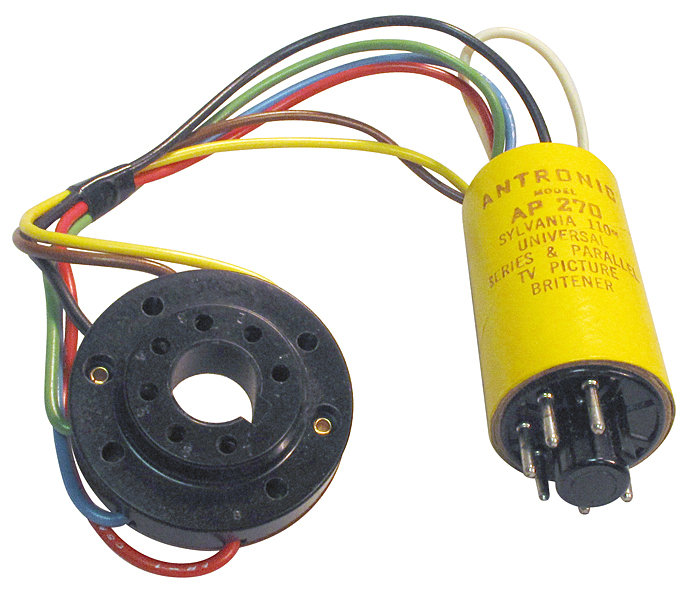 TV Alsonic CRT socket and harness. 14 pin. No terminals on position 8 & 10. Mfg. P/Ns: 92282. 54701/500. Sylvania 110º base tube britener. Universal series, parallel. 7 pin base. Walsco Electronics Mfg. Co. Tube-NU "Picto-Cure". Model 750. Makes worn out picture tubes new again. Per literature, corrects 33 defects in all. Anchor Model AP270 series universal parallel picture tube britener for Sylvania. 110º base. No instructions. wrapped around socket. P/N: 70-18349-01.